The Octane Fitness XR650 Recumbent Elliptical is a bulky robotic looking machine that takes about the same space as the Inspire Fitness cs4 Cardio Strider. These machines are in the same category; however, both have great differences even in terms of their price tag. In as much as we would like to talk about the Inspire Fitness CS4, we can’t, because this review is all about the Octane Fitness XR650. This recumbent elliptical machine is obviously very conspicuous and can’t be seen and be ignored either. It has a lot of useful features integrated into it including the exclusives (3 booster programs) that also make it a strength training machine. 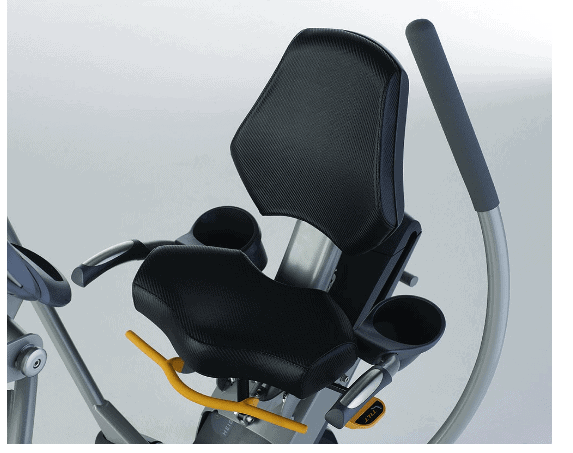 It has a unique power stroke pedal motion that allows the user to engage the glute activity 3X from what it could have been if a standard recumbent machine was used. Consequently, up to 23% more calories are burned. Simply put, it provides a better result. It has a sturdy light commercial grade construction that supports 400 pounds/181 kg maximum user weight capacity. The seat is completely adjustable making it possible for users of different heights and sizes to be accommodated. The console is telemetry enabled even though there are EKG sensors on each side of the seat handle which also transmit the pulse rate to the monitor when held during a workout. There are 16 preset programs that keep you motivated and focused on achieving your fitness goal(s). The Recumbent Elliptical Machine is belt driven and has frictionless motorized magnetic resistance system with 30 adjustments. Click right here if you wish to have a peek at the discounted price of the Octane Fitness XR650 Recumbent Elliptical on Amazon. 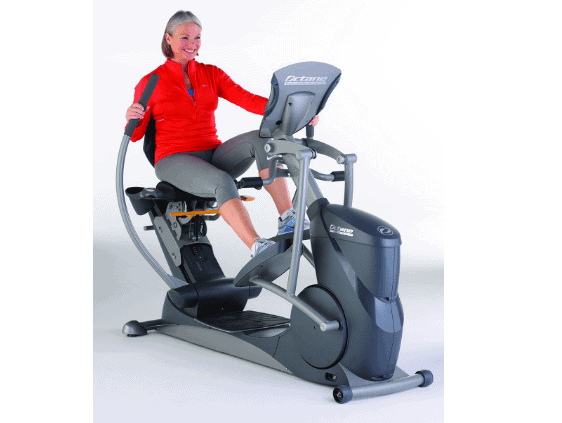 The Octane Fitness XR650 Recumbent Elliptical has a light commercial grade construction. It is made up of solid steel frame and ABS material that is mostly used for coverings. The machine is sturdy enough to support 400 pounds/181 kg maximum user weight capacity. The machine’s stability is superb because of the base framework that features a steel stabilizer bar at the front and the rear. The rear stabilizer bar is equipped with adjustable levelers that are used to balance the unit on a surface that is not even while the front stabilizer has rollers that aid in the relocation process of the machine. The machine’s weight (286 pounds/130 kg) further boosts its overall stability, ensuring that it is grounded even during an intense and vigorous exercise. The Octane Fitness XR650 Recumbent Elliptical is not a compact machine and neither is it foldable. It requires a little bit of space for workout and storage. The overall assembled dimensions are 72 inches long by 35 inches wide by 56 inches tall. In other words, a workout area of 6’ long by 3’ wide and a ceiling height of at least 7 feet tall will be required. Moreover, additional extra clearance of 1-2 feet will be necessary at the rear and on each side of the machine for safety and convenience reasons. 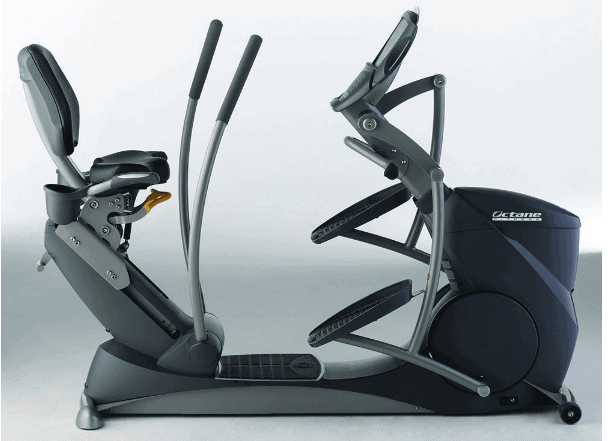 The recumbent elliptical machine has a front drive that is integrated with the unique power stroke technology that provides longer elliptical motion that allows users to engage the glute 3X more than a standard elliptical machine could and this results to outstanding caloric expenditure. Therefore, with the machine’s patented features (Chest press, Leg press, and the Muscle Endurance) and the 30:30 interval program a user should be able to burn unimaginable calories and tone muscle groups within a short space of time. Finally, it has a step-thru design that allows quick access. Just as indicated on the Octane Fitness XR650 Recumbent Elliptical machine’s name, it features a recumbent seat that is completely adjustable. It is 4-way adjustable; it could be adjusted upward and downward for a custom lower body fit and could be tilted back and forth for upper body fit. This means that users of different heights and sizes will be comfortably accommodated. The seat is ergonomically padded and contoured to provide natural comfortable feelings that enable the user to workout longer. On each side of the seat is a support handle that is coated with a rubber foam material for secure and comfortable grip and equipped with a pulse sensor that reads and transmits the data to the monitor when held on during a workout. There are the moveable handlebars that are integrated with high-grade ball bearing and connected with the pedals so that a user could work out the upper and the lower body. The handlebars are simply designed, while the grip handle part is coated with soft rubber foam material for comfort. As long as the pedals move the mobile handlebars also move and vice versa. There are footrests just below the console, which allows you to isolate the lower body so that you can concentrate on exercising the upper body. Also, you can grip the side armrests/handles instead of the moveable handlebars to exercise only the lower body at a given time. In other words, you can exercise the upper and the lower body simultaneously or do so separately. The pedals are antiskid designed and large with borders to ensure that your feet are secure and free from slippage. They are large enough to conveniently accommodate different sizes of gym shoes. They are interconnected with the mobile handlebars via the flywheel. Just as aforementioned, the Octane Fitness XR650 Recumbent Elliptical features a belt drive system whose operation is smooth and quiet. You can workout at any time of the day and the family or the neighbors won’t even notice what you are doing. The drive’s major elements are the heavy duty Poly V-belt, the perimeter weighted flywheel that is connected to the pedals. Just like any other belt drive system, it doesn’t require any post lubrication or adjustment. It is basically maintenance free. The xr650 Recumbent Elliptical features a 16 inches power stroke technology that allows the user to engage more muscle groups. Differently put, it has longer stride length for full leg extension which ultimately burns extraordinary calories as no other recumbent machine could. The Octane Fitness XR650 Recumbent Elliptical is equipped with an electromagnetic resistance system otherwise known as ‘’eddy current’’. This means that there is no friction when the resistance is engaged, therefore, no wearing parts. There are 30 resistance levels available and suitable for everyone at any fitness level, including those that are recovering from an injury. The adjustments are done via the console, easy and simple and the tension is felt on the pedals and the moveable handlebars. 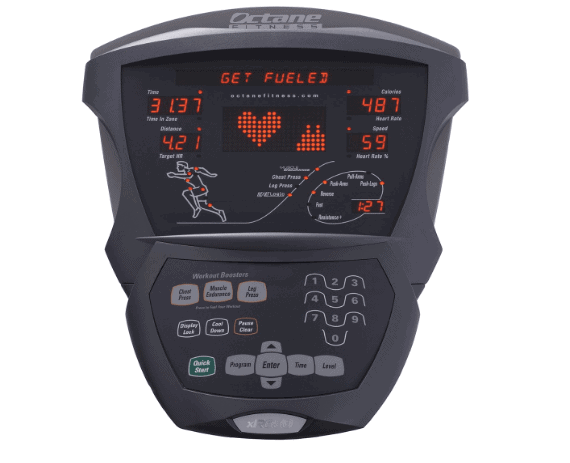 The console on the Octane Fitness XR650 Recumbent Elliptical does not have extra features such as sound system, cooling fan or online connectivity but has enough to ensure that your workout is productive. It features an LED display that has outstanding readability. There is about 6 display segment on the monitor designed to simultaneously display the essential workout data. The monitor tracks time, distance, target HR, calories burned, speed, heart rate, and heart rate interval. The console is telemetry enabled. This means that the hand grip sensors are not the only way to read your pulse data but you can also use any Polar heart rate chest strap device to monitor it. Unfortunately, the heart rate chest strap is not included in the package; you have to purchase that separately. It also allows you to enter personal data such as weight and age in order to accurately return workout output. There are 16 preset workout programs that include preset resistance programs, heart rate controlled programs, and advanced programs. This is the breakdown of the 16 preset workout programs. The pre-set resistance programs are 6 (manual, random, interval, custom interval, hill, and 10k), the heart rate controlled programs are 7 (fat burn, cardio, heart rate interval, heart rate custom interval, heart rate hill, heart rate speed interval, and new leaf custom), while the advanced programs are 3 (30:30 interval, constant watts, and constant METs). Then, there are the workout boosters (muscle endurance, leg press, and the chest press). These are exclusive to Octane and have Quick keys that allow you to select any of the programs. The chest press targets endurance building, strength improvement and the muscle toning of the upper body, the leg press is designed to target and build the strength, endurance and muscle toning of the lower body, while the muscle endurance is the combination of the other two boosters. The console is also integrated with a media shelf for tablet or magazine placement. The Octane Fitness XR650 Recumbent Elliptical is equipped with two water bottle holders which are designated on each rear side of the seat. These are important for staying hydrated throughout the entire workout session. The media shelf is also featured on the console so that items such as a tablet or a magazine can be placed on it for entertainment reasons. 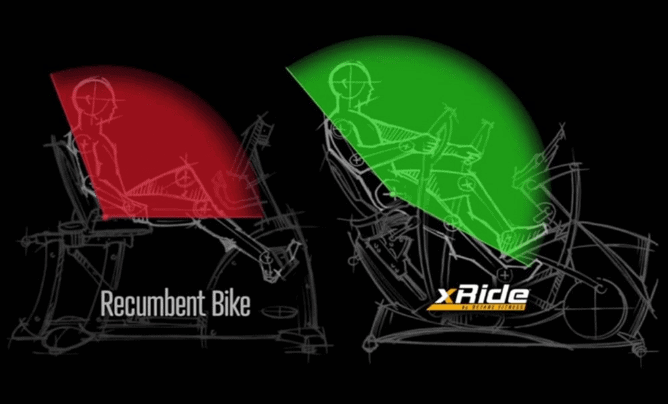 The Octane Fitness XR650 Recumbent Elliptical will require a bit of space just as indicated above. It is not a foldable machine has dimensions of 72 inches long by 35 inches wide and 55 inches tall. In other words, it will need a dedicated storage area of 6’ long by 3’ wide and must not be stored outdoors because of exposure to sunlight or rain. Despite the fact that the unit weighs 286 pounds/130 kg it is equipped with rollers at the front base for easy relocation process. The shipping cost of the Octane Fitness XR650 Recumbent Elliptical varies as it depends on the shipping policy of the vendor you are purchasing from; nevertheless, vendors such as Amazon provide free shipping and delivers the product within days from the day order was placed. The assembly of the Octane Fitness XR650 Recumbent Elliptical is relatively easy but may require two persons due to its weight. The equipment comes partially assembled with the major components such as the drive and the resistance systems already assembled. You will be left with other several parts to be attached to the core unit such as the front and the rear stabilizer bars, the seat and the backrest, the seat handlebars, the footrests, the mobile arms, the console mast, and the console. Included in the package are the tools required for the assembly and the assembly instruction manual that should walk you through the process of the assembly nice and easy. Just as we mentioned in several places on this review, the machine is basically maintenance free due to the integrated belt drive and the eddy current resistance systems. Therefore, parts replacement, adjustment or lubrication is not required. However, you will be tasked with the examination of the machine before use for any loose or broken part in order to prevent an accident or further damage to it. You must always keep it clean from dirt and sweat before and after use. The Octane Fitness XR650 Recumbent Elliptical is a high-level low impact cardio machine that features a lot of useful and exclusive features that make it stand out of the rest. It is inarguably expensive but its quality, design, and features provide even more reasons why you should consider adding it to your home gym.